This week, we're sharing a new project that we're working on heading into 2016 - tracking ownership change across the City of Detroit. Through our work, we know that updated property ownership information is invaluable to neighborhoods and community members in Detroit. Over the next year, we are going to be updating our ownership data in Detroit on a weekly basis and tracking every single change in Site Control, which is now available to everyone interested in collecting and mapping data. This analysis is made possible through Property Transfer Affadavits. Currently, when ownership change occurs the City of Detroit requires the new property owner to file the property transfer affidavit with the City of Detroit's Assessors Office within 45 days, or face a maximum penalty of $200. Below, you'll find a map of property transfer affidavits registered with the City of Detroit from December 7th - 11th. This data is coming directly from the City of Detroit's BS&A Property Portal. We categorized properties by owner type, distinguishing between publicly owned (owned by the city or a land bank), privately owned, and bank-owned properties. Out of a total of 1436 properties, 514 are publicly-owned, 916 are private, and 6 are owned by banks. The Detroit Land Bank is the top transferer this week, with 428 properties. Of these, 404 are vacant lots, which leads us to believe that the city is catching up on transfers from earlier this year.. The second top transferee, DETROIT 123 LLC, purchased all of their properties through the Wayne County Tax Foreclosure Auction under the name Gideon Pfeffer. You can download the data in the map interface by clicking "List" and then "Download CSV". We've added both Motor City Mapping data and Wayne County Tax Foreclosure Data. Please download it and check it out. Hello, all. This is Jerry Paffendorf, CEO of LOVELAND Technologies. You know we make property information free at makeloveland.com. We also sell Site Control, the world’s best software to collect and work with it. 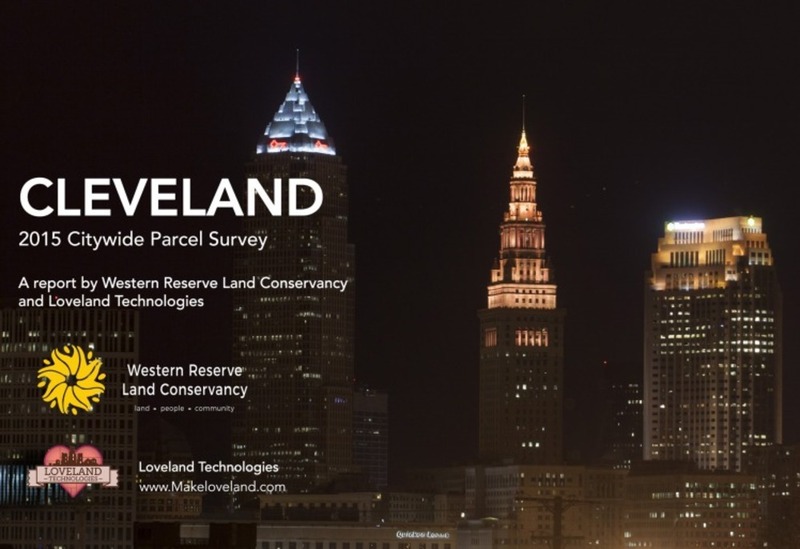 This summer, the Western Reserve Land Conservancy used Site Control to survey every single property in Cleveland, Ohio. We packaged the results into a new report and map they are using to raise funds, plan, and take action: makeloveland.com/reports/cleveland. The value is enormous, but the cost of our software and support for their organization was only $10,000. Some people say we're stupid to charge so little, but our vision is for everyone who works with property information to use Site Control. To help make that happen, we are willing to go above and beyond for organizational customers who sign up before the end of the year. You can see more about Site Control at sitecontrol.us, but you need to write to me at jerry@makeloveland.com or call 313-338-3825 for the deal. Please let me know if you're interested and I will reserve your spot or answer any questions. Waves of tax foreclosed properties still crash on Detroit year after year. In 2016, absent any kind of large scale intervention, 60,000 more Detroit properties will head to auction, approximately 40,000 of them occupied homes containing around 100,000 Detroiters. 2015 marked the fifth year LOVELAND tracked Detroit and Wayne County properties as they tumbled through the tax foreclosure process. Our understanding of the underlying system of foreclosure is more sophisticated than it was when we first put foreclosed properties on the map, yet we still feel like we're learning and large chunks of how the system operates still feel opaque to us. 1.) The reassessment of Detroit's property taxes. A major force driving the tax foreclosure crisis are Detroit's property taxes which are untethered from the actual value of Detroit property. The reassessment will be critical to bringing assessments into line and should prioritize participation in the payment of property taxes over the amount collected. 2.) Annual citywide surveys of Detroit property. As called for by the Blight Task Force, the city needs to be resurveyed annually to measure progress and inform decision making. Data collected in Motor City Mapping is approaching its second birthday, and resurveys thus far have been either topic driven (such as fire and foreclosures) or concentrated in certain neighborhoods. Data collected in citywide surveys can and should inform everything from property assessments, to fire prevention, to demolition efforts, investment, foreclosure prevention, and more. 3.) The next Wayne County Treasurer. The next treasurer has a huge hand in setting the agenda for the future of tax foreclosure, delinquent tax collection, the execution of foreclosure auction, and the direction of unsold or bundled property into public hands. Obviously, we're on the edge of our seats. The past five foreclosure auctions added a total of 54,299 unsold properties to public ownership roles in Detroit. In other words, more than 50% of all publicly owned land in Detroit fell into the city's hands in just the last 5 years. More than 12,500 of those now publicly owned properties came via the use of "blight bundling" which was first employed at scale in 2014 as a tactic to move blighted structures away from speculators and into the hands of the Detroit Land Bank where the properties could be demolished, sold as side lots, and fed into other land bank programs. For the first time since 2011, more properties went unsold in this year's auction than sold. Those 12,282 unsold properties will likely be transferred to the Detroit Land Bank. That's on top of the 6,366 properties that were packaged in this year's blight bundle. Data collected in the citywide survey of Detroit, Motor City Mapping, helped us figure out how many people are in homes going through tax foreclosure. A subsequent survey project we conducted revealed how many homes, occupied at the time of foreclosure, wound up vacant a year later -- nearly 1,000 of the 6,000 occupied homes sent to auction in 2014 are now empty. No resurvey of the occupied homes at the 2013 auction has been conducted, and of course 2015's auction has only just ended, but if 2014 is any indication, thousands of properties from the last five years that were occupied at the time of tax foreclosure may now sit vacant. Only 2013 - 2015 auctions are represented here as those are the years where occupancy data is available and our surveying operations have been active. Backcasting the occupancy data to 2011 and 2012 would be unreliable. Detroit's Hardest Hit Fund Zones, where federal demolition money can be spent, are often described as "tipping point" areas where intervention can prevent a neighborhood from slipping into vacancy and decline. The HHF zones have received significant investments including targeted demolitions, nuisance abatement of vacant properties, and auctions of rehab-able land bank properties. Perhaps as a result of this increased attention, residential properties in HHF zones at auction are garnering higher bids. The average sales price of a residential property (both occupied and vacant houses) inside a Hardest Hit Fund zone increased 111% between 2011 and 2015, compared to 40% for residential properties outside HHF zones. However, residential property sales in HHF zones at tax auction still outnumber, and sell for far less, than normal property sales. A recent report looking at the impact of HHF demolitions on willing buyer / willing seller property sales within HHF zones (i.e. non-distressed sales) found the average sale price of an occupied home was ~$24,000 (c. 2013 - 2015). There were ~5,500 willing buyer / willing seller sales of occupied homes within HHF zones in the period including the 2013 and 2014 tax foreclosure auctions. By comparison, there were approximately 6,500 tax auction sales of occupied residential properties inside HHF zones in 2013 and 2014 at an average price of ~$5,200. Another risk factor for the HHF zones, and auction sales across the city, is the rate at which properties sold at tax auction fall back into tax delinquency and foreclosure. Of the approximately 16,700 houses sold in Hardest Hit Fund zones between 2011 and 2014, 27% (~4,600) are current on their taxes. The 12,000 properties that fell delinquent, again, since auction sale are on track to return to foreclosure auctions over the next few years. The tax status of properties in areas like the HHF neighborhoods is an important indicator to watch. If auction buyers start to pay property taxes and avoid the cycle of foreclosure, it could be an indication that buyers see the properties as longer term investments, rather than short to medium term opportunities to extract rent from tenants while neglecting the property taxes, and walking away when properties return to auction. This kind of behavior represents only a portion of auction buyers, and it's a behavior understood only anecdotally, but we hear enough of it to know the dynamic is well represented across the city. Tax status data comes from the Wayne County Tresurer's tax payment portal, which Loveland scrapes for data annually when updates are made. The 27% tax payment rate amongst HHF properties is slightly better than rates citywide. Of 45,817 tax auction sales between 2011 and 2015, only 18% of properties (8,370) are current on their taxes. Everything else is either behind on its taxes and was foreclosed again in 2015 ("Foreclosed", in the chart above), headed to foreclosure again next year ("Subject to Foreclosure"), or headed to foreclosure in another year or two ("Delinquent"). That is how much is owed in delinquent taxes, fees, & penalties by properties sold at auction between 2011 and 2014 in Detroit. Citywide, there are $526,000,000 in uncollected delinquent taxes, fees, & penalties outstanding. New laws went into effect this year that aim to curb the ability for speculators to purchase property at auction when they already own other properties with unpaid taxes. However enforcement may prove difficult as speculators adept at using LLCs, or purchasing through family members, require time consuming research to identify. We have said it long enough now, but it bears repeating: Tax foreclosure is itself a symptom of deeper problems (unemployment, population loss, overassessed property taxes) but it is a symptom that can kill its host. It must be addressed if Detroit is to recover.